The first annual Nantucket Classic was held this past weekend (September 23+24th) on Nantucket Island, Massachusetts, with Southport and Soundings the top sponsors. 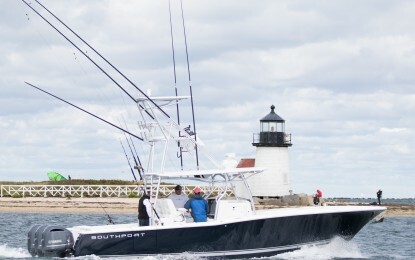 Southport had 4 boats at the event, with three fishing, and we are proud to say the Southport 33 FE, Summer Place took home 1st place, by a very wide margin. I was not part of that crew, and cannot tell you where they went to catch nearly 75 striped bass in one day, but I can say that they probably had a blast doing it. While they were catching all those tournament-legal fish, over on Team Southport, aboard a brand new 33 ST with triples, things were a little different. On day one we caught a number of fish but few were big enough to count. If there had been an award for variety though, it was ours for the taking. Our haul for the day included 3 Bluefish, 1 Albie, 2 Fluke, 1 small black sea bass, and a crab the size of a tangerine. Most interesting were the Fluke: they were both caught on deep-diving Yo-Zuri Herring-imitating lures, and these weren’t snagged- the hook was set in the mouth. Day two was a little different- a steady 20kts out of the north lead to a pretty strong chop running up to 4-5 feet. This is something totally manageable for a Southport 33, so we headed out mid-morning for a little bit of fishing. While the boat could easily handle it, the crew, especially with the light bite, were quick to throw in the towel and head for the cocktail hour. After getting skunked on the second day and knowing the leader was sitting comfortably in the clubhouse, we knew the 1st place trophy was not going to be ours. But as with any tournament or rendezvous, there is more to the event than the fishing, and this tournament had plenty of other activities. Friday evening we were treated to a cocktail party aboard the OCEARCH Shark tagging and research vessel (a former Bering Sea crab boat), and Saturday night we were hosted by Slip 14 Restaurant for the awards dinner. Both events were well stocked with on-island brewed beer from Cisco Brewery. It was a great opportunity to meet with other boaters and fisherman to discuss their day of fishing, their boats, and anything else that came up – politics and the election excluded. On Saturday night, the winner was crowned, and we are happy to say it was a Southport 33 FE who caught all those stripers, winning by a margin of nearly 9x over the second place boat. Congrats to Team Summer Place. The plans are already in the works for next year’s event. We hope to have a date set by mid-February, so keep your September weekends wide open!